7:30am - George spent a wonderfully comfortable nite sleeping in his bedroom on the new memory foam mattress. Baby Boid also spent a good nite sleeping. His first nite with Miss Twayler! Baby Boid is a very calm dude. There is a very good reason why Baby Boid is so calm. He is a very young boidy! Because Boid is very young, he did not spend very much time living at PetSmart. And so, did not have time to get acclimated to the fear of having hands come near him. And seeing others in his cage get grabbed and taken away. And because of his lack of fear, Baby Boid does not appear to be afraid of George at all. We believe that Boid will quickly become comfortable eating his seeds from George's hand. That's how it begins, you know. Step by step. 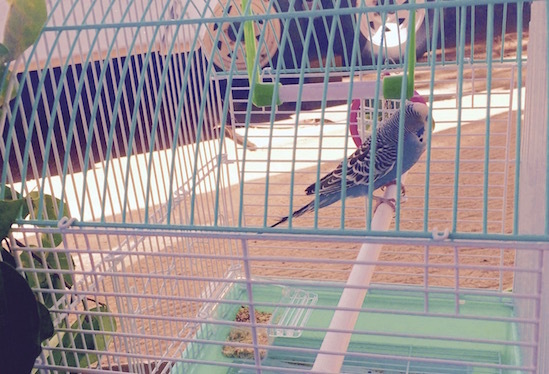 In order for Boid to become happy to be around me, he must come out of his cage. This happens in a small room. Our bathroom is the perfect size! I used one of Boid's cage perches, a stick about 15" long. Slowly moving the perch, placed it against Boid's breast, saying, "Jump." Then gently pushed the perch so that Boid would step on to it. Then, with Boid standing on the perch, slowly moved Boid out of the cage. Then, slowly, I moved my face to Boid and kissed his back. Boid did not fly away! He smells sooooo sweet! We on the TiogaRV Team, do not research places to camp. We just go, and find! In fact, we do not want to know what is up ahead. Ruins the excitement, don't you think? Since we began RVing in 2003, it has been the same. We drive along, and when we see someplace nice, make our Nite Camp! We might only travel 10 miles, and find our Nite Camp. That's OK for us. When we go to pick up Scampy next Monday [24th], we will be ready to camp. And likely, camp out for a couple of nites. 4:30pm - The wind did it! Just a few moments ago, Boid [new Boid] and I were together outside enjoying the beautiful afternoon. Suddenly, a strong wind came up. Only for a few seconds did that wind blow hard. But in those seconds, the wind toppled the ficus tree next to Boid's cage. I reached out and caught the ficus, preventing it from pushing over Boid's cage! We believe that we now understand how Little Boid [old Boid] met his fate. Of course, we likely shall never know exactly how Old Boid's fate turned out. But we may imagine, right? We imagine that Old Boid, with his superior brain, ruled over all the local boids like a king. And lived happily ever after. looks like all is under control. Will that be called Scamping? You mean camping for free in the forest? Yes! When did you get the bird? I must have missed that one. Sounds like fun. Little Boid became a TiogaRV Team Member on September 25th. He wasn't here long. But he was a mighty bird, all the while! Will you bring all your camping gear with you when you do to pick up Scampy? You mean, "RV Camping Gear?"